Jim Hansen's newfound peers at the Capitol Climate Action | Watts Up With That? 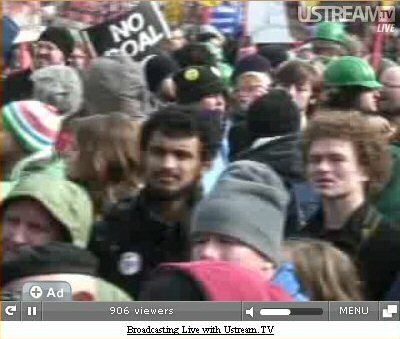 The Capital Climate Action protest went on today in Washington DC with a march on the coal fired power plant. Amazingly, NASA’s Dr. James Hansen actually showed up and took the stage at the protest to complete his transformation from scientist to political activist. But, we”ll leave the issue of his appearance there for another discussion. 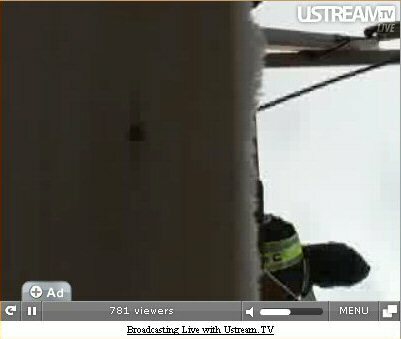 Here are some scenes from the live web feed today. Here’s a chronological order of the protest in a series of screencaps from the video feed. Arrival at the power plant. So THAT’s what those stimulus checks are for. 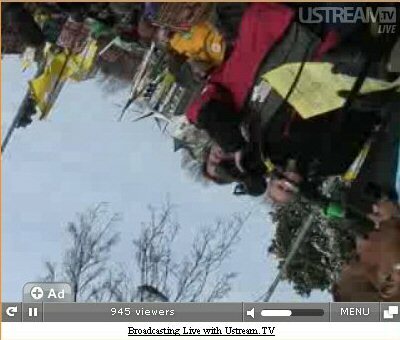 The camera operator put the camera down on it’s side for about five minutes, giving us this picture. Must have needed to get a smoke. Interesting things you can do with a scarf and coat hanger wire. 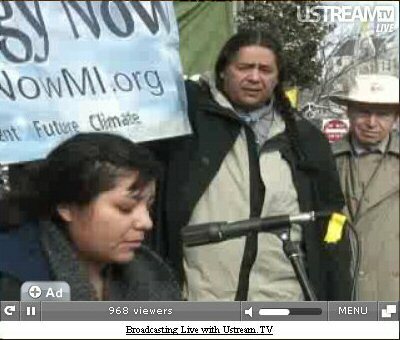 The Native Americans arrive to protest Black Mesa power plant. 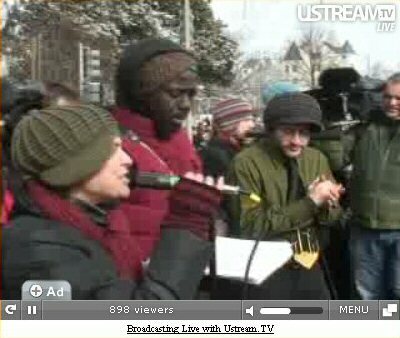 The hemp hat trio sings for the crowd. Bewildered or zoned? I can’t tell. Coal is dirty. Ok, but have you guys smelled yourselves lately? 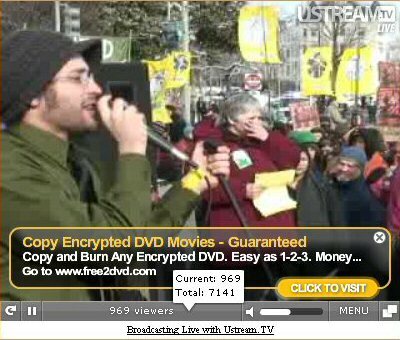 Not only can we save the planet, we can show you how to make illegal copies of DVD’s! Jimbo is warming up in the bullpen. And Dr. Jim Hansen is on the air! He’s making a succinct point. I’ll bet Jim had no idea he was being sponsored by Obama’s stimulus package….oh, wait. After Dr. Hansen left the stage, a hip-hop group sang his praises. Time for the mute button. The snow didn’t seem to interfere with the determined masses walking through it. Rage boy wasn’t present, but maybe he missed his flight due to snow delays. Most of the speakers recycled everything we’ve already heard before, it was pretty boring. The one highlight was Robert F. Kennedy, Jr. saying that Massey Energy CEO Don Blankenship “should be in jail… for all of eternity“. Oddly, Kennedy’s message seemed even a bit too extreme for some left leaning news outlets, such as AlterNet which didn’t mention it in this story on the protest though there were other quotes from Kennedy. The advertisements that kept popping up on the video certainly didn’t help the credibility. 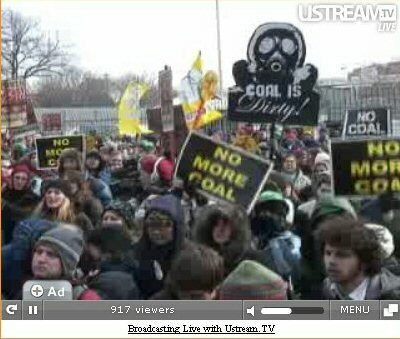 One of the chants was “No coal, no gas, no nukes, no kidding”. There was also “Nuclear Hell No”, “Biofuels hell no”. Apparently wind power and solar are the only options they endorse. Iwonder if Jim Hansen has figured this out yet, since he has advocated nuclear power. 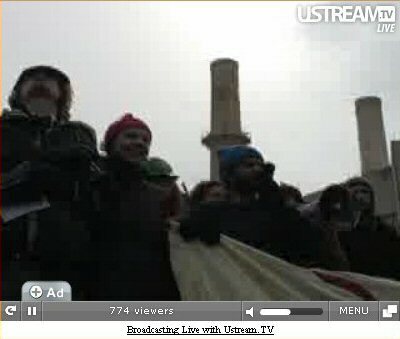 At no time did the simultaneous viewers counter ever reach 1000, the highest I saw was 970. Likewise the number of total viewers that were counted never exceeded 10,000, and the final I saw just before they went off air for the first live feed (with Hansen et al) was 9978. It appears that many people clicked to check it out, but few stayed for the long haul. There was lots of singing, chanting, and dancing. Drumsbeats and other percussive instruments filled the air. The native indians used to have rain dances to control the weather, these dances and chants seemed to be aimed at controlling the climate. How far we’ve come. They claimed victory and went home, nobody was arrested. Unfortunately I don’t think they realize that simply blocking the gates for a couple of hours is not quite the same as shutting down the boiler. March 2, 2009 in Climate_change, Fun_stuff, Politics, Ridiculae. Let’s demand that the Capitol be powered by the Cape Cod wind farm with no T.Boone Nat. Gas generator backup. Looks like just another hippie gathering to me. I wonder if these people realize just how essential coal is in powering this country? By the way, I agree that the ads “pooping” on the video did not help its credibility at all. Did George Soros get his money’s worth? ” You fool you touched the death ray, now we all die”. And after freezing for a few hours, they all rushed off to a more pleasant fossil fuel controlled environment in their car, hotel or Starbucks to discuss their great victory over the forces of evil that keep them alive. Like not a blip up here. Whose side is the Flying Spaghetti Monster on anyway? Reply: Ok that was funny. ~ charles the moderator who is taking the rest of the night off. REPLY: I had to look this up, I don’t get out much like Jim Hansen does. Somehow these quotes seemed appropriate to me. I wonder if the entire annual carbon output of this tiny power plant equals the amount of carbon released in all the jet, car and diesel bus fuel burned by hippies running to and from this event. Gotta give these nihilists credit though. They sure know how to pick their battles. 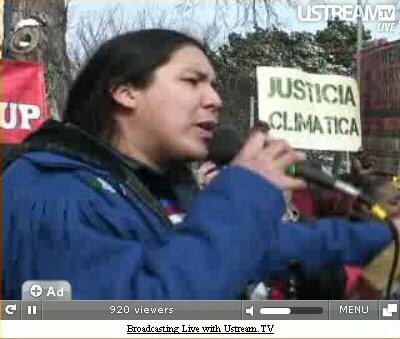 I would be interested to know the total carbon emissions resulting from the travel of these folks to the protest. How did Dr. Hansen travel down from NYC? Plane? They all probably bought “offsets” from Al Gore. How many activists actually turned up to protest ? Theye were hoping for 2500 but it doesn;t seem like that many. Any idea ? Whatever it was, I will bet it wasn’t nuclear powered. Hansen arrived by Space Shuttle. Oh wait, NASA is no longer supporting the space shuttle, NASA is now a political activist organization. I believe Dr. Hansen has found “his people”, but he has a way to go in adopting the tribal uniform. That goofy trench coat and safari (?) hat combo ain’t gonna’ cut it with the dreadlocks and bong set. It also appears he lost part of an ear to that oversize hat. Doesn’t smoking marijuana produce CO2? No way there were “thousands” there. Maybe over a thousand including press, and considering that they were spread around the perimeter of the plant. One interesting thing I noticed was that there were several young people playing the role of leaders and leading chants, doing introductions, etc., but it seemed there were some adults in the background actually running things. The young “leaders” seemed to be disappointed in what they could and could not do, and at one point a police official walked up to these folks and told them that he had an agreement on timing with their “leader,” whom he had gone over the details with prior. Kids looked confused and when he described the person in detail, they still had no idea who he was talking about. Unfortunately, next time they will ramp it up and do something stupid. Hope no one gets hurt. I wonder how Jim’s new friends will be welcome at the NASA cafeteria? Do they serve hash cookies? I’m confining my remarks on this matter to my own website http://tinyurl.com/bkdsh9 mainly because I don’t want Charles to snip me. Same old rent a crowd, same old rent an activist. Pick a cause and you will see the same old faces, Europe,North America, Asia. Some of these people even fly internationally to picket a cause. This might be a good example of the balancing effect of the Taijitu Yin (white snowfall) & Yang (black coal). The problem here is that it seems that the attendees had both forces (fire & ice) arrayed against them. Is it no wonder then that their coal protest got a cool reception? Maybe this should be a new SAT question to expose the pro-hemp crowd. “REPLY: I had to look this up, I don’t get out much like Jim Hansen does. When you do get out please have more fashion sense than someone. Remember, people have to look at you–I think someone forgot that. 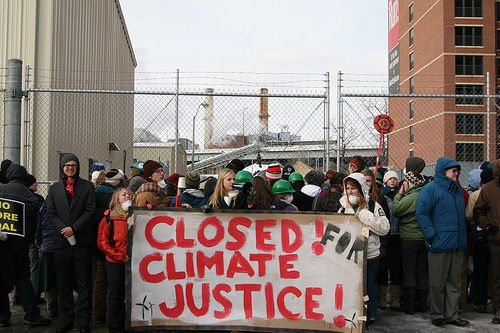 And btw, what exactly is ‘climate justice’? And how do we get it? After seeing film of this lame event I can honestly say I’ve seen better film on teeth. There’s like 40 people there. For goodness sake, do they actually feel victory today? I feel sorry for the college students who flew in to it, if any did, thinking they were going to be at some huge rally. 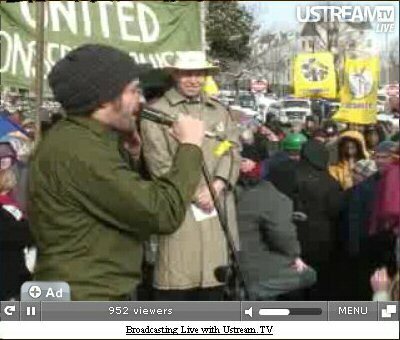 With the amount of people there what does that say about James Hansen’s (and global warming’s) star power? I think it’s time for the AGW crowd to hire the Iraqi Information Minister from Gulf War II to help them with their cause. Remember him? The guy who said there were no Marines in Baghdad while video of Marines in Baghdad played across the screen? Seriously, these people need to find and hire that guy. He’s about on their level. He would be perfect for their protests and speeches. All those people bundled up against the bitter cold protesting the heat. Cosmic irony. 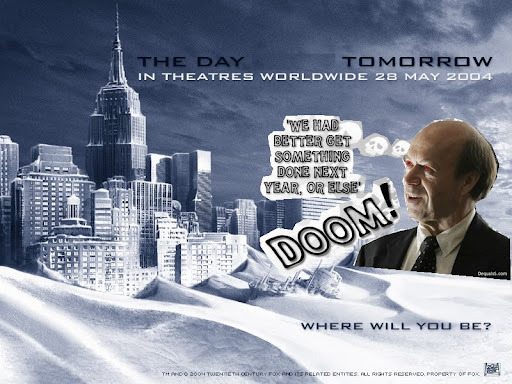 But then again AGW theory has predicted that CO2 will cause more extreme weather events like DC’s near record cold, and the increase in Antarctic ice and……. This is Monty python type sillyness brought to life, I mean, says the psuedo revolutionary to his followers, what has ‘fossil fuels’ ever done for us? Hmmm! mass transportation,science,education,hospitals,industry,jobs,medical advancement,roads,cities,tax revenues for social programmes, Yeah OK but apart from that, says the psuedo revolutionary, what has ‘fossil fuels’ ever done for us? The entire modern advanced society that we live in was built on fossil fuels from the laptop to the medical scanners that save our lives to the houses we live in to the fridges that keep our food fresh to the trucks that bring us that food to the electricity that powers our homes/schools/hospitals etc! The gross ignorance of the AGW/MMCC is amost beyond parody, the new anti science mumbo jumbo mixed with a large measure of childish wishful thinking is actually going to destroy everything our ancestors worked so hard to bestow upon us, freedoms that we enjoy today are taken for granted and even despised by those who wish to return us to the dark ages. note on previous comment : only “lame” was meant to be bold, not the whole half of the comment. Don’t know how to make those features work right yet. No Kidding. Hmm.. freudian, or what? 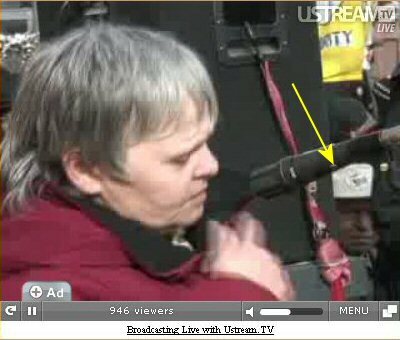 Did anyone ask how they were powering the PA system or the camera? Was Ed Begley there with his stationary bicycle to power all of that? It might be very inconvenient and might even results to deaths especially when the weather is very cold. At last the hospitals and those catering for the sick and the weak could be informed in advance. BUT COULD ALL THE POWER STATIONS JUST COME UP WITH A DAY OR EVEN A FEW HOURS OF SHUT DOWN TO SHOW TO THE PUBLIC AND THE REST OF THE WORLD WHAT IT IS LIKE IF HANSEN AND HIS CROWD’S DEMAND IS COMPLIED. Lets face it. When it comes to public relations and hype Hansen’s and his crowd has the upper hand. They have all the energy and carbon dioixde generate to produce the hype and publicity for one hour “earth hour” when everybody switch off anything that consume power. Whatever carbon dioxide reduction is minimal and might even be negative when the power zoom back after the earth hour. Why dont the power plants just organize earth day, switch off all the coal fuelled power plants for a day-not an hour to save the earth. Might even be for a week. Why just one hour– a hype. Show to the world what it is like if all the coal power plants are off rather than an hour when people switched off the light. He’s that guy from GISS whose rally, and clothes, must not be mentioned! I think bringing back history lessons to schools, and the teaching of objective thinking, might help some students to look at things in perspective and context. We had this back in the UK in the 1970’s during the industrial disputes. The power would go off for a few hours and the country stood still. They even used to turn off the power half way through the evening film for good measure. Luckily, most people used gas cookers so could still eat and central heating was still just for the lucky few. Good old fossil coal files kept us nice and warm. Things would be a bit different for this needy generation. So common techniques for misleading the public used then. Oh and not many shots of the ground. Only one showing a road that has been cleared of snow, but none of the surrounding snow covered earth, just a few of the snow in the trees in the back-ground. 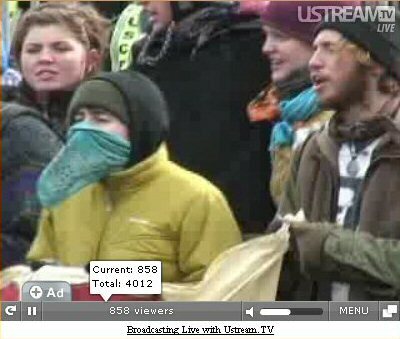 Even then these people do look mighty cold for people protesting against global warming. As for some of the chants….”One of the chants was “No coal, no gas, no nukes, no kidding”.” … They really DO want us to return to the stone age. Do any of these protesters live in caves? If not, then they are hypocrites. All in all this was a small failure of a protest that backfired and showed the protesters up for the well-meaning idiots that they are. That was both funny and sad: funny to see Global Warming activists freeze their arses off while achieving nothing; and sad because on the same day all this was going on, an example of a more real and immediate threat to life on Earth passes by giving us only 3 days warning (see http://www.foxnews.com/story/0,2933,503164,00.html, http://ssd.jpl.nasa.gov/sbdb.cgi?sstr=2009%20DD45;orb=1, or http://www.universetoday.com/2009/03/02/asteroid-2009-dd45-just-buzzed-by-earth/ for example). If only a portion of the wasted energy and effort that goes into AGW activism was spent on preparing for threats that have happened before, will happen again and are perfectly well understood, those trying to “save the Planet” would have something real to be proud of. By the way, it seems that the Washington weather may not have been caused by “The Gore Effect” after all; never underestimate “The Jonah Effect” of the current British Prime Minister: http://www.order-order.com/2009/03/ill-wind-blows-from-east-jonah-goes-to.html. I wonder if any of them realize you can’t get rid of coal without replacing it with something that provides an equivalent amount of power- and it doesn’t make sense to replace a power plant before it’s end of lifed. Should we suffer blackouts and vastly increased energy prices because of a fear of CO2? It’s ultimately the consumer who will pay for it. Conversion losses. People need to understand them. Dear US contributors. 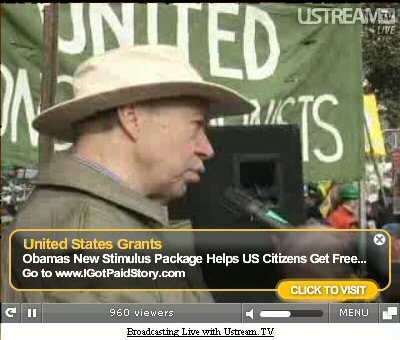 Is Dr James Hansen actually in breach of his contract with NASA as a government employee by helping to promote and presenting himself at such a rally? If so I guess he waited with taking this latest move until the Bush administration was out of the way. He probably calculates that with the Obama administration in place and and his friend Al Gore’s increasing influence he is now one of the truly “untouchables”. Was that it? The biggest ever global warming demonstration? 500 people? Fairly pathetic performance by the Twittering Class. Maybe people are finally seeing the light. R John, you may have spoken in jest, but……. “Copenhagen, which will host the crucial UN Climate Change Conference in less than 300 days, has become the 100th member of the Climate Change Network (CN Net). 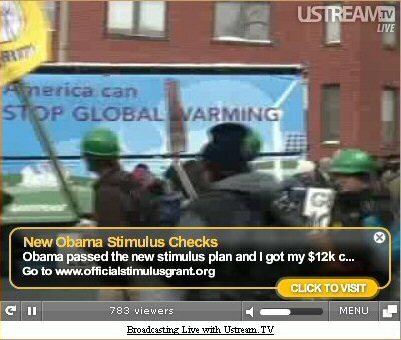 Now that’s what they mean by hundreds of thousands of green jobs will be created! He’s available. he’s just been acquitted by the Iraqi court system. We are one with the Borg. It didn’t go down too well! The chanting stops the thinking. Alfred North Whitehead, philosopher of Oxford, used to start his lectures with the statement: “Human beings will go to almost any lengths to avoid having to think.” Would he have had fun with these guys! That’s Tariq Aziz, the man that AGW needs is named “Muhammad Saeed Al Sahaf” also known as “Comical Ali” or “Baghdad Bob”. So much for civil disobedience. Nobody seemed to have thought to bring chains and locks to chain themselves to the powerplant fence. On the down (plus?) side, all those tongues stuck to the fence would have put a crimp in the chanting and speeches. This crowd reminded me of the movie “The Day After”. I must say that Hansen blends in perfectly. I think the poster here must understand two important facts about this protest. 1. Although only a small group of protesters showed up at the event, 12000 people have been in a meeting with top Obama staff. These 12000 people will be trained in organizing protests. What we see here is the creation of a tool that enables Obama to enforce his political objectives by a controlled use of “public protest”. Mao, Lenin, Stalin and Hitler knew the power of this tool which is currently used in Russia, Venezuela, Cuba and North Korea, in short, it is a well tested tool used by Communists, Socialists and dictators. 2. This is positive: There has been a counter protest. The came with only thirty people but they were there and they drew media coverage. “I was out there at our counter-protest today and it was cold. 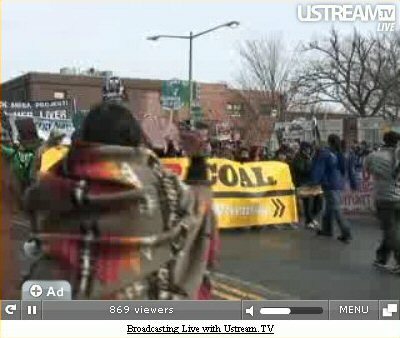 There were 6 or 7 hundred anti-coal protesters and about thirty of us. We spent a couple hundred bucks, they spent a few hundred thousand, and we got a significant fraction of the media. “I’d like to do a cost benefit comparison of them and us using carbon dioxide emissions as the unit of value. “Last night, Sen. Jim Inhofe’s office responded to forecasts of a dangerous storm with mockery. “A winter storm sweeping up the East Coast with rain, snow, and ice has caused 350 car crashes in New Jersey, a 15-mile-long traffic jam in North Carolina, and four deaths from car accidents in Massachusetts, Rhode Island and Long Island. Hundreds of thousands of households lost power from Georgia to Maine. I looked on the CCA site yesterday and it had a few “facts” about coal. It said, coal plants are the “least job intensive” industry in the US. Now i have a couple problems with this statement. 1) its completely wrong. (each coal plant in the US employs roughly 2-300 people including shifts, management, labor, contractors varying on size) 2) a wind farm may employ alot of people to design it and build it but once its up and running, it only needs skeleton shifts to make sure they dont fly apart in high winds (see earlier post on wind turbines on WUWT) not to mention all the men and women who are employed to work in the coal mines to fuel this nation. its a good thing coal cant be outsourced. I suggest taking a look at their “facts” and letting them know exactly how rediculous they actually are. Let us not be too quick to rush to judgment; Dr. Hansen may be on to something here. If the Washington DC coal powered electric generator is closed down and Washington DC is taken off the power grid, the ability of the looters to giveaway trillions of our dollars to their political cronies will be seriously impaired. To save the Republic, let’s make Earth Hour a 24 hour, 7 day a week, 365 day a year event in Washington DC. Will the last person to leave the Whitehouse please blow out the candles. As long as they weren’t “scratch n’ sniff,” I might actually buy one. “I looked on the CCA site yesterday and it had a few “facts” about coal. It said, coal plants are the “least job intensive” industry in the US. Now i have a couple problems with this statement. 1) its completely wrong. (each coal plant in the US employs roughly 2-300 people including shifts, management, labor, contractors varying on size) 2) a wind farm may employ alot of people to design it and build it but once its up and running, it only needs skeleton shifts to make sure they dont fly apart in high winds (see earlier post on wind turbines on WUWT) not to mention all the men and women who are employed to work in the coal mines to fuel this nation. its a good thing coal cant be outsourced. I suggest taking a look at their “facts” and letting them know exactly how rediculous they actually are”. You can not compare coal and wind energy in terms of performance and continuity. The output of a windmill is determined by the availability of wind. We need at least 1.000 windmills to deliver the energy provided by a menium sized coal plant. The price for this energy is the price of the windmills + the costs of a back-up energy plant for periods without wind. As a consequence the energy bill for consumers will double and if the back up plant is taxed for CO2 emission taxes the bill will triple. Because this back-up plant must be able to start up and shut down quickly, this will be a gas power plant. At this moment in the coal and gas are the cheapest solutions. Both are available in abundance, sufficient to secure the US energy needs for at least the next 500 years. This was the “mother” of all demonstrations! (Gulf War I). Back to the “stoned” age. It’s interesting that their web site resembles some of the communist publications of the 60’s in color and tone. and/or “silence dissent” to me. The first horizontal axle windmill, according Wikipedia, was applied in Wales in the year 1291 AC. The windmill was used for sawing, grinding and pumping water. In the Netherlands wind wills were used to dry lakes, gain land from the sea and to regulate the water level. The windmill was replaced by the steam engine which started the industrial revolution. The steam engine was more reliable than the windmill and came with higher capacity. Today some geniuses have decided that a windmill propelling a turbine is able to replace our coal based energy infrastructure. A windmill ladies and gentleman is LOW TECH, LOW CAPACITY AND UNRELIABLE and can never replace coal power plants. I thought Vietnam was over….. They claim 2500 attended, but really it’s about a fifth of that. They claim the climate sensitivity to a doubling of co2 is 3C or more……. Obama backs plans to retire the space shuttle next year, which could leave the United States without a shuttle until 2015 when it plans to send Ares rockets and the Orion into space. The executive budget proposal does contain funds to study greenhouse gases and global warming. That tells us where this administration’s priorities are. Looking at the crowd, I now realize what a service the Grateful Dead had provided all those years. It gave these people something to do. Ah yes, the magical moment of Dionysian tribal togetherness. Not quite a Woodstock-era event, but it still captures the spirit. And then let’s toss in a touch of civilization with an appearance of a moment of rationality in the person of Dr. Hansen. Mr Watts this is the coffee police! Place the cup on the table and step back. No one will be hurt! Put the keyboard down too! You don’t really want to hurt someone else with bad puns! These are the same folks that will sign any petition, even against dihydrogen monoxide. They are joiners, not thinkers. The phrase “useful idiots” describes them perfectly. They would be deserving of our pity were it not for the fact that idiocy reigns supreme in our schools, and in our government, and gets trumpeted by the MSM as science. The lunatics have indeed overtaken the asylum. Sorry, this snide post and comments is irrelevant and self-indulgent. Why are you trying so hard to belittle some run-of-the-mill protest? You know what they say in advertising: referring to a competitor’s marketing is a failure of your own. Is it just me being a silly woman, or are other women freaked out by the trenchcoat buttoned to his nose hairs and a hat pulled down to his bellybutton? Seriously, I’ve never seen a person working at any wind farm I’ve seen. I haven’t really seen many turbines working either, for that matter. Wind farms aren’t even job intensive for machines. Why are you trying so hard to belittle some run-of-the-mill protest? 1. I don’t think you have to try very hard. 2. It wasn’t billed as a run-of-the-mill protest. And Bobby Kennedy, James Hansen and members of Congress don’t typically bother with run-of-the-mill protests. And in the spirit of the Civil Rights movement, we’re also asking people to help confound our detractors by dressing to impress. looks like jim hansen is trying to bring back the good old days of woodstock, flower power and free love…lmfao!! !…the National Aeronautical and Space Administration should be proud one of their top scientist’s spent the day on taxpayer dollars hanging out with a bunch of groupies freezing their asparagus’ off protesting hotair…you just cannot make this stuff up…priceless!!! I am well aware that wind and coal cannot be compared performance wise. Unfortunatly our friends over on the green side have not realised the futility of wind farms. I was simply making a comment on the statement made by the CCA saying that coal plants are not job intensive. windmills and windmill farms employ very few people compared to the number of people employed by coal plants. The editorial in last weekend’s Australian, “Carbon trading is not the only answer” (21/22 February), addressed the controversial issue of the government’s planned emissions trading legislation, commenting that “We need to hear other ideas on greenhouse gas reduction”. Talk about missing the point! For the pressing issue that we need to deal with is the hard reality of natural climate change, rather than wasting money on futile attempts to “stop” speculative human-caused warming. If ever we needed a reminder regarding the power and danger of natural climatic events, then Mother Nature has just provided us with two. The northern half of Australia has been submerged under floods, and large areas of the southeastern corner of our continent have been ravaged by firestorms. These events resulted from unpredictable natural events such as our planet has ever been heir to. Just as the “science” that is cited in favour of dangerous human warming caused by carbon dioxide emissions shows all the hallmarks of orchestrated propaganda, so too the real science shows beyond doubt that the wide array of extreme natural events – which include climatic warming trends, cooling trends, step-events, heat waves, droughts, cyclones, floods and snowstorms – poses great dangers for humanity. “Greenhouse gas reduction”, by any means, is an irrelevancy, for it deals only with the speculative problem of as-yet-unmeasured human-caused global warming, and that at a time when the globe has been cooling for ten years. In contrast, a national climate policy that better improves our ability to recognize and adapt to real (i.e., natural) climate change and events is an urgent necessity, and would cost but a fraction of the mooted carbon dioxide taxation scheme, a non-solution to a non-problem if ever there was one. By their very nature, strategies that can cope with the dangers and vagaries of natural climate change will readily cope with human-caused change too, should it ever manifest itself. Australia needs adaptive policies to deal with real climate change in place of the government’s expensive, inefficient and ineffective plans to “prevent” an entirely hypothetical global warming. Why is it so difficult for our major political parties to discern this obvious truth? The “CCR” (Climate Change Revival) yesterday in Washington D.C. put me in a philosophical mood, and I’d like to put some thoughts out that may lead to a better understanding of how to get the non-AGW word out. I think the comparison of AGW proponents to a “religious movement” is apt; the example of Galileo and the Church may miss the point. While that conflict was between the “Church” and an individual bucking tradition, the battle we are in today is different. I think it more resembles the Reformation – the split of Protestant and Roman Catholic belief systems. I can speak to this as somewhat of an insider, a Presbyterian Elder, a person who’s studied church history and the Bible most of my life. Those are my credentials for this piece. My intent is not to preach but to examine the similarities between the reformation and the argument about the reason for “Climate Change”. The Roman Catholic Church, for years, sold “indulgences”- literally pieces of paper that took away sin – for a price. “Sinners” purchased these instruments in the belief they would escape punishment for their transgression(s). Of course, the price matched the “sin” it “indulged”. Enter Martin Luther, a Catholic Priest, who wrote his “99 Theses” and nailed it to a church door in Germany. It detailed his opposition to “indulgences” and other church practices of the time. He was promptly defrocked and thrown out. His intent to call the church on questionable practices resulted in the germ of what is now the Protestant belief system as he started a new congregation. So, now you have a brief (and biased) historical look at the start of the reformation, how does that apply to climate change today? At that time, the Bible was in Latin, the language of the learned classes including Priests. Those who are credentialed on both sides of the climate issue speak (write) in a language that most of us don’t understand – with names and acronyms that are obscure to the average reader. Priests had the “true knowledge of God” and were cloistered away from society. They, it was rumored, did miracles. Scientists now are the priesthood who have all manner of wonderful and magical stuff to tell them the truths of the universe. They spend time in places the population as a whole only dimly understands, places like university labs. I’ll stop there because many more parallels exist but this is long already! Like Martin Luther, those scientists who choose to speak up are excommunicated from the clergy. Like Martin Luther, they form small congregations (blogs) and attempt to make the settled theology (science) plain to the “masses”. Like the early part of the reformation, some are even put to death (no government funding). I think this piece of history and what’s going on now with AGW have many similarities. It is not science VS religion; it is religion VS religion. For many of us, it is those who we follow in the blogs have the right idea and are ethical about data, and those on the AGW do not and are not. Both are beliefs; because the majority on both sides are not those in the labs, we – largely believe what we are told by those priests of the data. A last and hopeful point. The Roman Catholic Church at the time had the mass media on its side, was powerful politically, and controlled teaching in the schools. Even so, Martin Luther and his colleagues were able to start and grow congregations despite the opposition. This was also “Natural Climate”. It happened in the past and it could happen again at any time in the near future. Is this what the warmmongers want? “People across Europe awoke on 6 January 1709 to find the temperature had plummeted. A three-week freeze was followed by a brief thaw – and then the mercury plunged again and stayed there. From Scandinavia in the north to Italy in the south, and from Russia in the east to the west coast of France, everything turned to ice. The sea froze. Lakes and rivers froze, and the soil froze to a depth of a metre or more. Livestock died from cold in their barns, chicken’s combs froze and fell off, trees exploded and travellers froze to death on the roads. It was the coldest winter in 500 years. But what about the coming 100 million AGW climate refugees? I guess we needed to start counting at this protest? REPLY: as was the protest. If any protester did anything other than walk to the event then they are hypocrites. This protest got a mention on BBC newsnight last night. Check out the report by ethical man. Apparently 12000 young people attended the demonstration. Nearly 50% of the electric power produced in this country comes from coal, and these morons, along with Hansen, and Obama want them shut down, and this, to you is irrelevant? What rock did you crawl out from under? 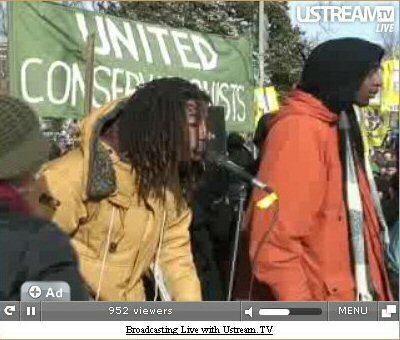 This was billed as “the largest civil disobedience on global warming in U.S. history”! Now they are claiming “victory”, and vow that “this is just the beginning”. They not only invite mockery, they demand it. You want to brush up on your etimology. If movies are the key, obviously the cold turn-out indicates some GW’ers may have been shaken (shaking?) but few were stirred. Thank you for this illuminated comparison. There are many (comparisons) in the history of authoritarians silencing dissent. Though you see the conflict delineated in the struggles of the Reformation, I think it applies to all manner of minority voices. In particular it applies to Galileo as the order of Inquisition was based on his publication of “Dialogue Concerning the Two Chief World Systems.” Like Martin Luther, Galileo challenged the authority of the Church. His telescope had proved it was not the earth at the center of the world – it was the sun. The order to withhold funding from scientists that question the AGW status quo – is little different than the Inquisition. It is certainly not in the interest of science, nor in the long term, the planet and its people. Eventually (as we are seeing even now) the truth breaks through the cloak of darkness and is seen and heard by the public. In the case of the Reformation, Luther’s manifesto quickly brought about an entirely new version of Christianity. In Galileo’s case, his and Kepler’s and Copernicus’ work sparked the birth of modern astronomy. 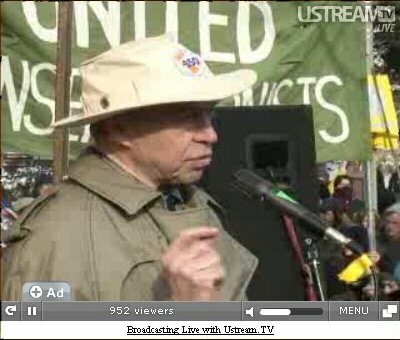 John Peter (00:47:59) : Is Dr James Hansen actually in breach of his contract with NASA as a government employee by helping to promote and presenting himself at such a rally? If so I guess he waited with taking this latest move until the Bush administration was out of the way. He probably calculates that with the Obama administration in place and and his friend Al Gore’s increasing influence he is now one of the truly “untouchables”. It would seem that he is violating the Hatch Act but don’t count on him being called out for it. If the rumors are correct, Obama may have been endorsing this and a lot of Congress probably does as well. Hopefully Nancy Pelosi’s absence indicates failing Congressional support. She said it was because of the inclement weather delaying her flight but was reluctant to give any specific details. OTOH, maybe she meant a GW march in a snowstorm has as much impact as complaining about drought in the middle of a heavy downpour. No power from coal or nuclear sources outside the area could be brought in through the power grid to replace the plant’s production. All politicians and bureaucrats would be required to be in town and stay there for the duration. An additional side benefit, given that there appears to be few people left in D.C. who have the native intelligence to count past ten, without power to electronic tally boards the Congress would have a difficult time enacting anymore socialist programs for the duration of the event. Martin Luther, Galileo, Issac Newton… Such lofty company! Difference: they did the legwork and took their lumps until orthodoxy was replaced. And they were brilliantly correct. Bruce Cobb: Let me rephrase my point. Why would a “science blog” be giving so much gleeful attention to a political protest? As you well know, Obama has not called for coal plants to be shut down. He did say that new coal plants shouldn’t be subsidized. Pragmatic: I gotta ask – who wrote “the order to withhold funding from scientists that question the AGW”? I want to kiss his pinkie ring so I can keep on his good side. Interesting version of history you both come up with. Sounds like the history books you have been reading are about as useful as Dr Hansen’s books on climate change. Luther set up a new church. Dead Right. It wasn’t the church that had existed since the time of Christ. Was he in favour of the ‘little man’? No. He insisted that in the areas where he was able to win over the local prince (eg. Philip of Hesse) the people would all have to submit to Luther’s ideas (cuius regio eius religio). He had no time for anybody (eg. Anabaptists, Calvinists) who came up with new interpretations of the Bible that he disagreed with. Luther claimed that the only authority was the Bible but he insisted that only his interpretation of the Bible should be allowed in Germany. The 1532 Peace of Nuremberg specifically excluded Calvinists from any recognition in Germany. Luther was totally on the side of the Princes in putting down the Peasants’ Revolt. Incidentally, Philip of Hesse wanted to have two wives – so Luther said it was OK. And as for Luther’s views on the Jews: the moderator would be forced to snip them. Michael J Bentley says: “Like the early part of the reformation, some are even put to death”. Yep, there were over 300 Catholics put to death in England alone between 1530 and 1680. Many of them were executed in a most vile way and after being subjected to horrendous torture. Sorry to submit something that has got nothing to do with climate change but some people have decided to write misleading versions of the so-called Reformation and I don’t see why they shouldn’t be challenged. So, to all the people who, for whatever reason, want to make comments about religion: Can we just keep to climate change, please. It’s hard enough trying to follow the relevant arguments without being distracted by people who have totally irrelevant agendas. And, if I can go back to the real purpose of the site, I find it very interesting. I don’t understand all the science but it’s intereresting to see what a nonsense all this ‘consensus’ stuff is. Try a Google on Capitol Climate Action Rally. There is incredible no major press coverage of this rally. NOTHING at all in the online version of the Washington Post’s Tuesday paper. NOTHING online at the NY Times. It there some kind of weird press whiteout on this march, or was it just too silly to report? Will brush up on my etymology if you brush up on your spelling. Yes, I agree there is much more in most history lessons than what can be brought out here. And some of what you say is a valid caution to the rest of us when “religious” thought gets people crosswise with one another. My purpose, and, I think Pragmatic’s was to point out past events that had a parallel to the AGW argument, for lessons they might have for us today. But let’s get real here. If the adage that “He who does not read history is doomed to repeat it;” is true, then looking at historical events is a valid exercise, and very relevant to the discusson here. Don’t confuse exploration of a historical event, or a part of one, with a discussion of theology. The James Hansen appearance is here at about the 1:53 mark. Let me rephrase my point. Why would a “science blog” be giving so much gleeful attention to a political protest? As you well know, Obama has not called for coal plants to be shut down. He did say that new coal plants shouldn’t be subsidized. Because, as you well know, thanks to AGWers, the debate about AGW is just as much about politics as it is about science. Which is a far cry from simply saying that “new coal plants shouldn’t be subsidized”, as you well know. Furthermore, isn’t it logical to think that if new coal plants would be “charged a huge sum for all that greenhouse gas” that existing plants would be charged a huge fee as well? That could, in fact, have the effect of shutting existing coal plants down as well, as you well know. So, conveniently, he doesn’t have to say that that is the goal, but as both he and you well know, it will have that effect eventually. Surprisingly, our AGW cousins have been conspicuously absent in decrying yet another example of WaPo inaccuracies. I see a couple comments on Obama and coal. Bruce Cobb: As you well know your made-up what-if Obama scenarios are just hot air. “Thanks to AGWers” this is essentially a political debate? My point exactly – this is fundamentally a political blog, and this kind of post demonstrates that. Just want truth…: Love it or hate it, the video of Obama answering a question about “dirty coal” (referenced here to damn him?) seems in line with conventional energy and climate thinking, not sneaky woo-woo commie talk as Bruce infers. Some people see politics in everything. You may not be seeing the largest part of this blog–that would be science. You and I have a different segment of the population in mind when we use the word ‘conventional’. Sometimes the way one thinks is the way that one thinks everyone is thinking. Did you ever read the book “Bias” by Bernard Goldberg? I listened on audio. I recommend it highly–very highly–to everyone. Bruce implies, not Bruce infers. Back in the 1930’s people had wind power. A wind charger on a high spot near the house and a huge rack of big batteries in the basement. (The batteries might not have been too big, but I was small and they looked big to me) Anyway there was one light bulb in each room, but there also was a kerosene lamp for times the wind didn’t blow enough to charge the batteries. I see a great future!!! One of the “rent-a-mob” protesters shouted “Australia is burning!”. That’s news to me, while there are bush fires in Victoria (And NSW) and it is sad at the loss of life and destruction, Australia isn’t burning (Although it is the “scorched land”). But we had a program on TV last night that claims temperatures are rising. Temperatures don’t stop arsonists sadly (The CAUSE of much of the fires in several states including Western Australia recently. Fires start where there wer e none. Burning embers start other fires). If by “hot air” you mean common sense (something AGWers posess very little of), then why yes, you are correct. …”this is essentially” a blog about puzzling things in life, nature, science, weather, climate change, technology, and recent news? Why, yes, we agree on that as well. sneaky woo-woo commie talk as Bruce infers. Do you always speak such childish nonsense? Typical AGWer troll – you see only what you want to see, secure in your AGW pseudoscientific ideology. Just want truth…: Are you referring to the same Bernard Goldberg who just wrote “A Slobbering Love Affair: The True (And Pathetic) Story of the Torrid Romance Between Barack Obama and the Mainstream Media”? Bias indeed. Thanks for trotting out yours so neatly. The science here generally serves a right wing/libertarian purpose, which is fine, but it’s important to recognize that. Imply/infer – Actually pretty much interchangeable no matter how “strict” you consider yourself. I shudder to think of the intellectual ferocity you bring to bear on its vs it’s. REPLY: Ben your statement “The science here generally serves a right wing/libertarian purpose, which is fine, but it’s important to recognize that.” is without merit, and I take personal offense to your labeling, don’t say it again. I could just as easily make the same sort of silly (and wrong) generalization about you because you use a Macintosh. It is events such as the topic of this thread that is politicizing/polarizing the science. The head of NASA attended and spoke at a political rally that openly advocated anarchy. Doesn’t that concern you? Imply/infer – Actually pretty much interchangeable no matter how “strict” you consider yourself. Um, no, they are not interchangeable and mean completely different things. Standard English dictionaries are quite clear on this. I shudder to think of the intellectual ferocity you bring to bear on its vs it’s. It’s is a contraction for it is. Its is the possessive form of it. The two are completely different. There is a reason language has rules, it is so people that understand language can communicate freely. You should learn to understand these rules, particularly if you are going to criticize the intellectual capability of others (by implying the thoughts here are merely ideology). “Do you ever try to get your research published in Science and Nature? Senior Scientist for Climate Studies at NASA’s Marshall Space Flight Center, recipient NASA’s Exceptional Scientific Achievement Medal for global temperature monitoring with satellites. Spencer is U.S. Science Team leader for the Advanced Microwave Scanning Radiometer flying on NASA’s Aqua satellite. Apparently, even a peck on the pinky does not propagate publishing! His testimony to the U.S. Senate Environment and Public Works Committee utilizes many references to view AGW from an historical perspective. Again, I have to say you see everything through political colored eyeglasses. If you were unable to easily detect how the media was on Barak Obama’s side through the entire campaign then you are unable to think in an unbiased way. Even Hillary Clinton talked about the bias toward Obama. Imagine that–Hillary Clinton pointing out the bias in the media! Bias in the media had been her ally for years. I don’t remember her pointing bias out when the media was her friend–it was don’t ask don’t tell then. It is easy to detect something about you, that you are a animal of politics. Politics can be seen in the cruel-edge attack style in your writing. It can also be seen in the continual thread of leftist politics in your blog. This stands to reason, that you are from the left of politics, since poll numbers show that the left of politics has the greatest percentage of adherents to global warming. I hate politics. I do not question global warming because of politics. I question global warming because the data does not support it, and because climate models are flawed. you need to supply references to validate what you say. If you do not supply references then you are just giving hypothesis. Or, you are giving opinions without ever intending to have backing of it. And you can’t do that here. Why? Because this is primarily a science blog. And science, real science, requires verification. Bernard Goldberg is a touchy name with those on the left of politics because he used to be one of you. But he left you. Now he is exposing, and making fun of, all of you. I wonder where the got those cool plastic green faux hard hats. I wonder how many ended up on the ground. I wonder where they got those cool plastic green faux hard hats. Ask George Soros, the puppet master. The puppets just assume they came from the globaloney fairy. Something you have to understand about Bernard Goldberg : this title comes from his sense of humor. He knew when he made this title how it would drive some people on the political left crazy. Your reaction is exactly what he knew would happen in some people. After all, isn’t it obvious the title is humor? That some people can’t see humor in it is his inspiration to make that the title. But it’s just sense of humor. It’s all just humor. Lighten up Ben. I say that as a friend. Anyway, back to the topic of this thread : I was wondering if in James Hansen’s quieter moments the small turnout has him thinking about things. Mark T: Regarding imply and infer you said “Um, no, they are not interchangeable and mean completely different things. Standard English dictionaries are quite clear on this.” The first Google hit for “imply” is Merriam-Webster 2: to involve or indicate by inference (etc. etc.) usage – see infer. Pragmatic: Not sure what to make of Dr. Spenser’s opinion about his difficulties getting published in Science or Nature. Saying that they “come up with some obscure non-reason why” isn’t a particularly sturdy premise. ~snip~ Entirely political. ~dbstealey, mod. Notice there is not one picture where you can see snow! We had well over a half foot in the area. Bitter cold in the teens. The local news called it a protest against pollution and never mentioned that it was a CO2/AGW march. Is “entirely political” referring to your own snipping, or my comments? My experience here is that the “moderation” here is primarily a tool for handcuffing “liberal” criticism. Political comments that suit your bias, unless they are OBVIOUSLY off their medications, are regularly approved. This is called hypocrisy, and goes the heart of this entire web-site’s credibility. All most of you have are ad hominem attacks on Dr. Hansen and the scientific community by supposed homo sapiens (homo for short). I was there at the Capital Climate Action in Washington DC, March 2, 2009 and had the pleasure to hear Dr. Hansen speaking truth to power on climate change. Coal is responsible for a third of green house gas emissions responsible for climate change and is a volatile commodity with an expensive future. Coal is responsible for a third of green house gas emissions responsible for climate change and is a volatile commodity with an expensive future. Well then, so long as you’re not going to protest nuclear power, pristine land covered by solar collectors and photovoltaic panels, and scenic, delicate ecosystems being overrun by hazardous but mostly useless wind turbines, go ahead and have a blast. Otherwise, you’re going to have to reevaluate your perspective at some point. I didn’t know that coal was responsible for 30% of atmospheric water vapor. Thanks for the update. In my view, imply is used in describing some action by some person who is trying to persuade/influence me in some way. It typically imputes some intent to the person alleged to be doing the implying. However, infer is pretty much neutral and does not impute intent to the person making the inference. Of course, as with many word pairs that relate to similar areas there is overlap in meaning. However, that does not mean they are interchangeable. Well what’s so bad about shutting off the heat in congress? Seems like a good idea as long as they don’t do it elsewhere…well maybe at Hansen’s house too. Yeah… they’re different words, different meanings. One happens inside your skull, the other proceeds from your mouth, it seems.